and I was not let down. 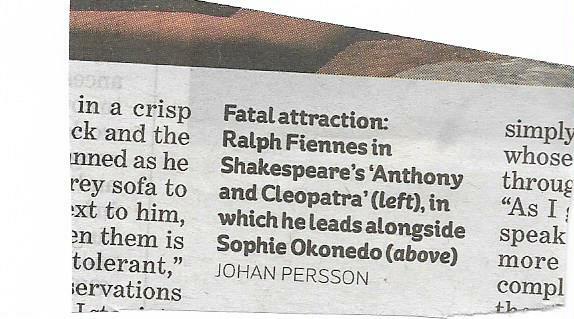 There is some cretin at the i newspaper who not only does not know how to spell Shakespeare’s Antony (perhaps Shakespeare comes into the category ‘It’s before my time so how should I be expected to know?’ which seems to be the covering excuse for ignorance these days) but cannot even copy the name. And if we are to believe the editor (see #450), he or his deputy reads every word in the paper, as do a whole bunch of other titles. If this is the case they all need sacking. I’m a sub for a title you routinely take to task on this website and share your anger at the state of this underrated profession. That said, I think you’re a bit harsh at times. You can’t on the one hand acknowledge that ‘Staffs have been so reduced that no one has time to guide anyone else’ and on the other write off everyone as useless and deserving of the sack. The small band of freelance subs I work with (4 or 5 per shift) are expected to race through articles at light speed. A single (frazzled) revise sub is expected to look over the entire newspaper, while the senior editors sweat over the big stuff. Most nights it’s mayhem. The old days of spending hours on a single article are over. Yes, some of the errors you describe are unforgivable, but they’re also inevitable when subs are undertrained, underpaid and overworked . Anyway, on a more positive note, I’ve learnt a lot from your blog over the last few months; it really is a fantastic resource. Thanks so much for putting it out there. Thanks for taking the trouble to write. Yes, that is a fair point about being busy, and that is how it was when I was on the Mail too. Mayhem would have been an understatement for the last couple of hours. We had only one revise sub too, and in the latter days even that post was dispensed with, so you have a luxury there. Certainly we all make mistakes and either write in or let through literals, but I tend not to pick those up (except when I can’t resist Mail Online) because I agree these are inevitable. What I am mainly complaining about is lack of curiosity, lack of general knowledge and satisfaction with low standards. However it would be a reasonable point to make that the copy you are handling is below par too. The whole state of written media makes me despair. The cost-cutting policies of management are selling readers short, and staff too. I will bear your comments in mind. PS Sorry it took so long to reply. I have been getting at least 100 spams a day which I went through to pick out the occasional proper comment, but after I was on holiday for a fortnight it got up to 2,000 and odd and I rather lost the will to live. My son has just put some sort of filter on which has brought it down to manageable numbers and hence yours came to light.